If you stare into the abyss . . . It was Nietzsche who said "If you stare into the abyss, the abyss stares back at you." And what does it stare back at you with but the Eye of the Abyss. The Dungeon Saga expansion "Eye of the Abyss" came out as part of Edge of the Abyss Kings of War campaign last summer. I talked about this when it originally came out last October, but I didn't have it in my hands to do a real comparison of the models. I recently got a copy, and being late has never stopped me from before, so it won't now. This expansion doesn't come in large book/box like the others. It is a booklet of quests (half the size of the others), a set of abyssal minion, five new models (with their stat cards) and a few magic items for them. 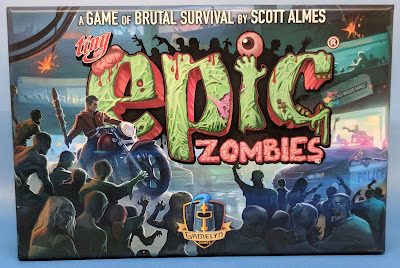 The art is great, and the adventures are laid out in the same way as all the other expansions. One note is that this expansion requires the Infernal Crypts expansion, for tiles as well as the minion card and overmaster deck for the main adventures. 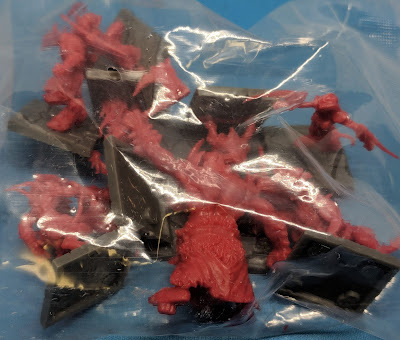 I do like how the set mixes up the minions - the first half uses the basic undead from the core set, then the second half is down in the Abyss itself. I would have liked at least one level to have mixed the minions, but with these two sets that narrative would have been a bit more difficult. 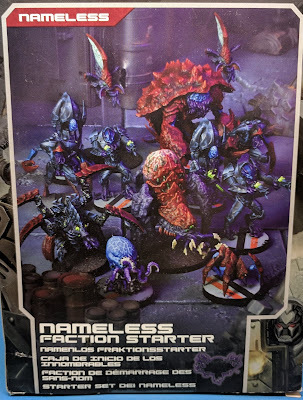 One thing that most people are looking for are the new hero miniatures. 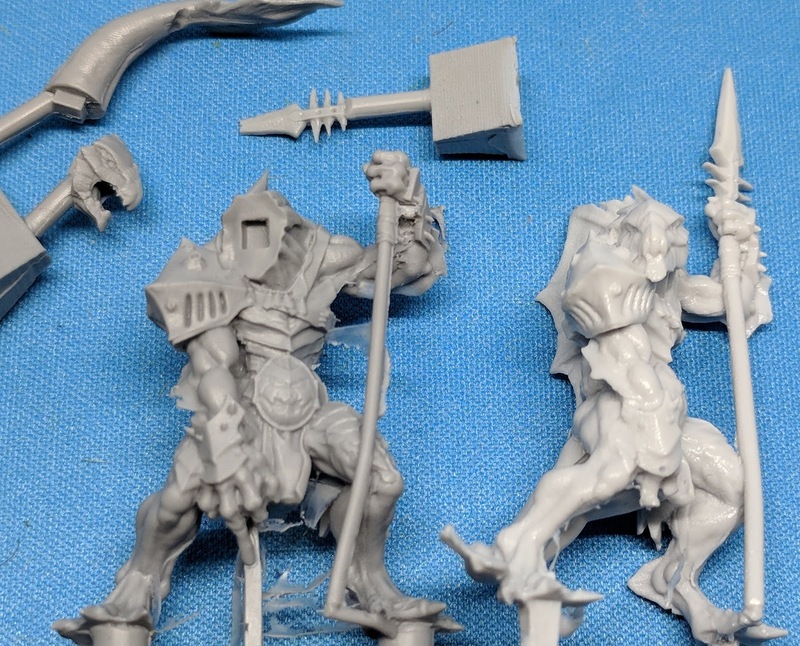 These are single piece versions of the heroes already released for Kings of War. I wanted to compare the two versions of each piece, to show the differences. Overall, either version of each hero could be used as needed. The multi-piece resin do have slightly crisper details, and a little more flexibility as they are several pieces. The DS versions have simplified the poses a little to make them a single piece, but in no way does this limit their functionality if you wanted to use them in Kings of War (either as the heroes themselves (with their stats in the Edge of the Abyss campaign supplement), or as generic heroes for your armies. 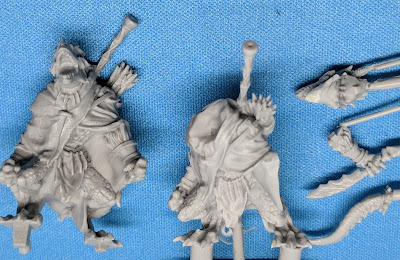 If you are a very serious painter then you might want to stick with the KoW variants, but for most of us mere mortals either will work just fine. So we'll start with the simplest sculpt to the most complicated - so that means we start with Jarvis, the Ophidian Necromancer. 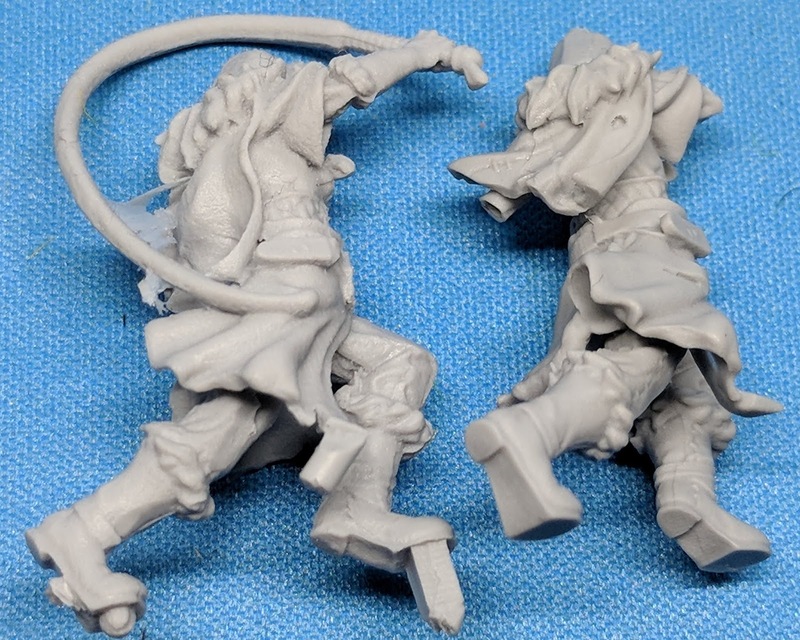 The model on the left is the DS version, the one on the right is the KoW variant. 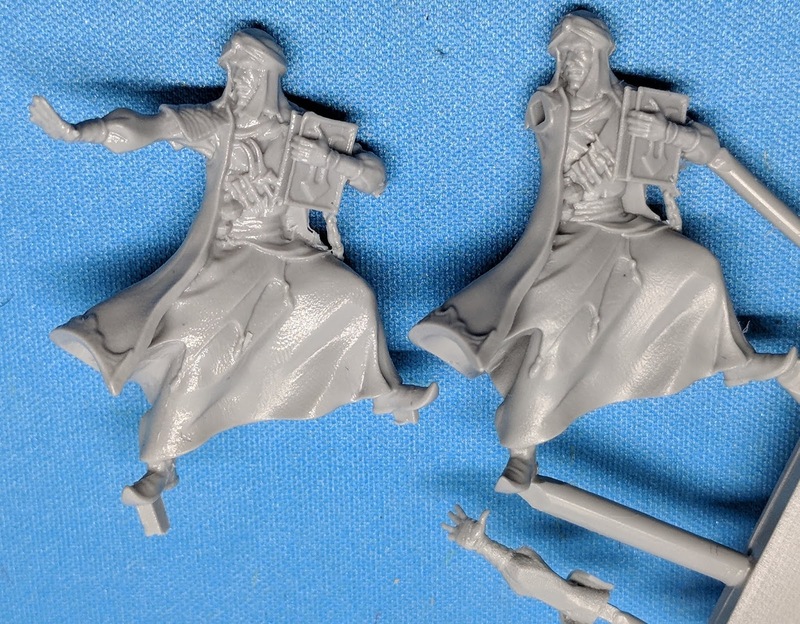 While in two pieces, the second piece is just his arm and hand, there really isn't any posing that can be done here. The angle is slightly different - with the DS version being 'flatter', so that it fits in the mold. It is interesting that for this model, there is actually MORE detail on his chest / bandolier for the DS version than the KoW one. However, on the downside, the textures of his robe and cloak are rougher, which is especially noticeable on the back. The detail edge of his cloak is where the real difference comes in. On the left it is a bit blurry - it would be very challenging to have the markings on the edge come out well. On the right the details are much crisper and the texture smoother. The rougher texture on the DS variant here is obscuring the detail of the cloak edge a bit. I'm a bit neutral on the knife hand - sure having it separate is better, but not significantly so. However it is the whip that is more significant here. The KoW variant allows you, via dipping it in hot water, to pose the whip just about any way you want, while the DS one has the end again attached to her body (again, this has to fit fairly flat into a single mold). 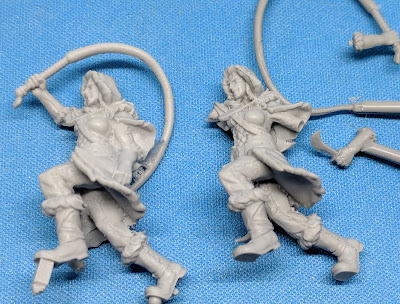 Here the details of the KoW variant are much more pronounced - the stitching on the leggings pop and will be very easy to pick out, while on the DS variant you can barely make them out. Same goes for her leather armor on her stomach and back. Also her short cape is much smoother, but also has more detail (with both a rip and a stitched tear on it that the DS one does not have). Artakl, the Clutch Warden from the Salamanders is next. Here her head, arm and tail are separate pieces, once again making this significantly less flat than the DS version. Once more the texture of the flat areas of the mini is simply rougher on the DS version and the KoW one. 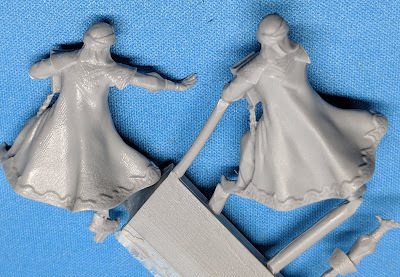 Interestingly enough, I wonder if this texture would be easier to pick up for a less experienced painter, using it to help add detail on the flatter surfaces of the model. In fact, the DS version may actually be MORE difficult to paint for experienced painters that want/need to obscure the texture here. I can hear my old friend Bill in my head "thin your paints". A less experienced (or in my case lazy) painter would be using thicker paints, thus obscuring the textures, as opposed to someone who is used to using several very thin layers to achieve the effects they want, each layer showing the rougher surfaces. However that could also be an advantage, if they wanted to actually make the clothing a bit more realistic for the time (which would have generally been wool, which has a bit of a rougher texture than our modern cotton or synthetic fabrics). Eckter is a Placoderm Defender from the Trident Realms of Neritica. So far he is one of the more popular models because he is ROCK hard in Kings of War (I played against him last year, and he held up the flank by himself. Again coming in four pieces (this time the KoW version is on the left - because I can't manage to be consistent) (actually I took ALL the pictures with the KoW variant on the left, it is just that for the previous three I took the pictures upside down as the light was better in the box that way (so when I flipped the picture they changed sides) (you can tell if you look at the shadows)). 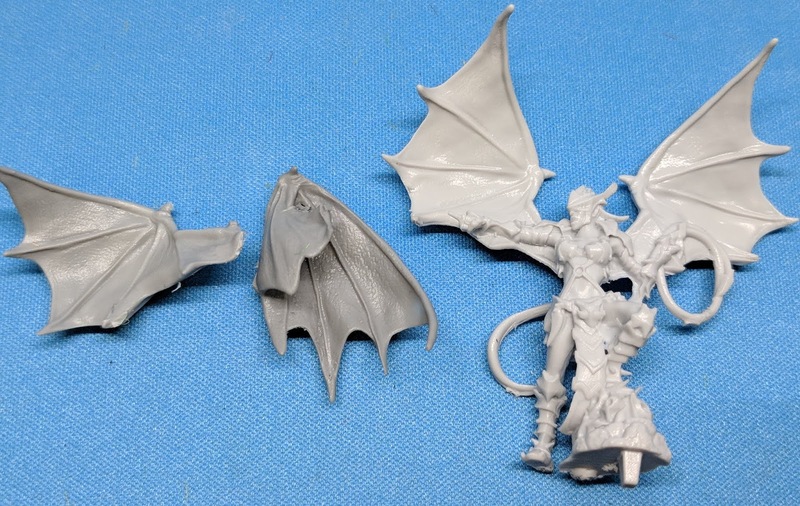 Once again Eckter comes in 4 pieces - with the tail giving the model the most depth. 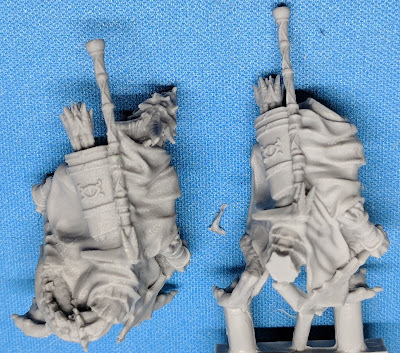 On my version, the tip of the spearhead had snapped off (the resin for the KoW variants being just a little more brittle than that of the DS ones). 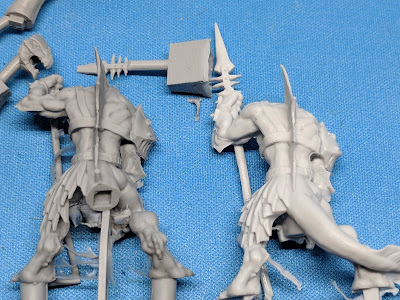 Long, thin, straight poles can be tricky - I think that if I were to paint either version of this model up I would actually cut off the spear and replace it with a brass rod instead, adding the spearhead back to the top of it. I really don't like that the spearhead is separate here - you will need to pin it anyway to keep it in place. Here the change in pose is more significant - the DS version is turned almost 90 degrees, looking straight over his right shoulder, while he is stepping forward. 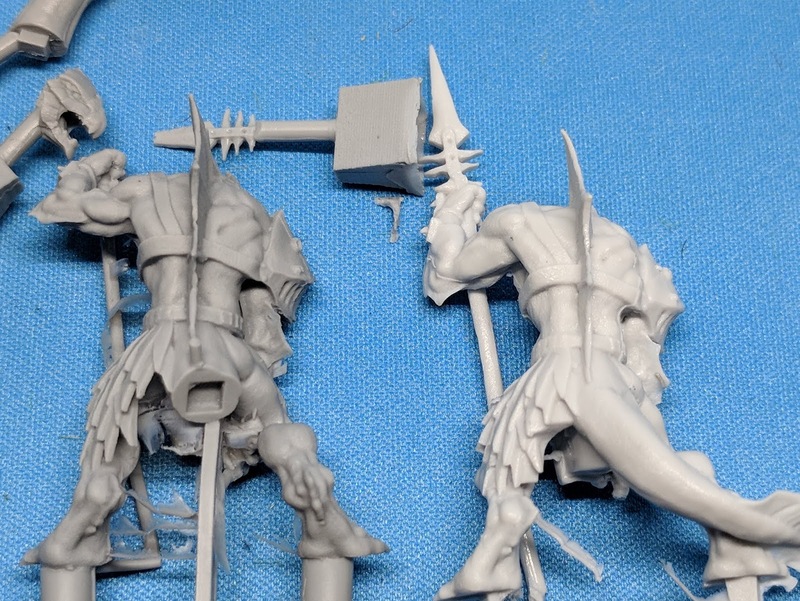 This can cause a little confusion if you are not careful gluing him to the base as to which side the front of the model is. 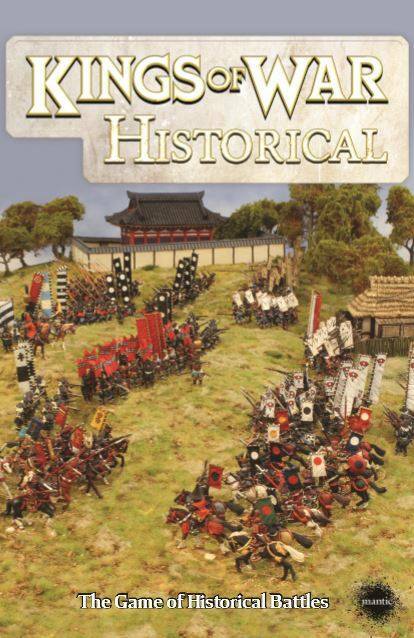 Also, the details on the DS version here seem to be quite a bit weaker than the KoW variant. The right hand (down by his crotch) being a great example of this (though if you are going to go through the trouble of having a single finger extended then we all know it ISN'T supposed to be the ring finger). 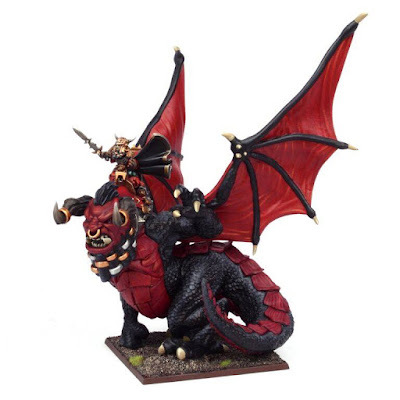 On the back, you can see that the tail is molded against his right leg (again keeping the model flat), while having it separate for KoW allows it to point out the back more naturally. There is a bit more cleanup required on the KoW model here (though the answer as to why there is so much crap in his crotch is one I don't want to know). Finally we come to Mau'ti-bu-su, the Abyssal Succubus Temptress. 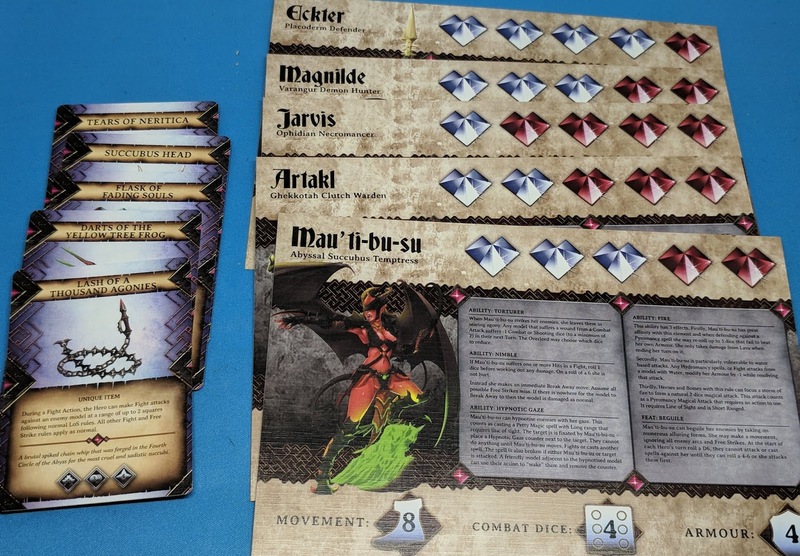 While Kara had used Eckter in her Trident Realms list a little, Dave has a temptress standard in his Abyssal list (though not always with wings, so it can be a little confusing. Just to be different, this one comes in 5 pieces - two arms and two wings. 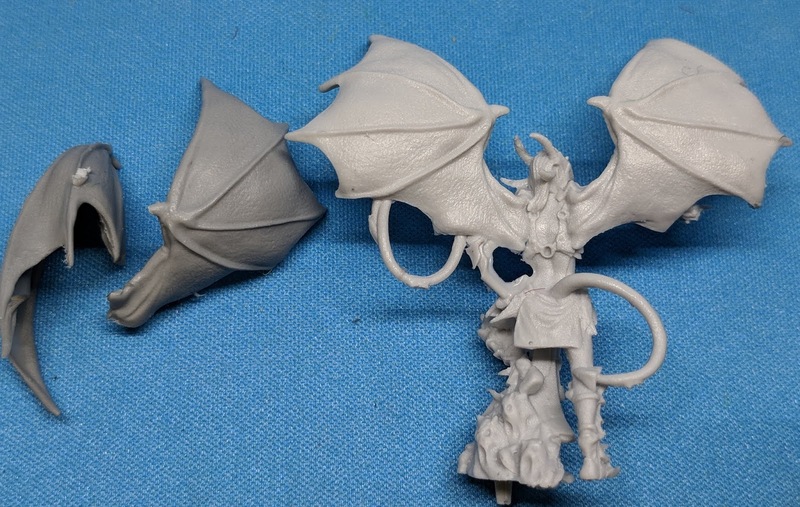 Once again the DS version is molded much flatter - with both her arms molded against her wings, and her whip and tail both being attached to the model at the ends. The face is also softer, and there seems to be much less detail on the rock she is standing on (though that is the least important part of this model by a long shot). The whip being a separate piece again allows for more posing opportunities - but unfortunately this also makes it a little more fragile. It is interesting to note that BOTH tails curve around to attach to her leg. One interesting point is that in the DS version, she has 4 horns on her helmet - which she only has the two in the KoW one. I'm not sure if these broke off, if they were separate and I missed them, or this was a deliberate choice. On the back side of her head, you can see some rough spots - I wonder if, when removing the body from the sprue, someone at the factory accidentally cut off the horns, thinking they were vents for the resin. Most significant difference here though are the wings. 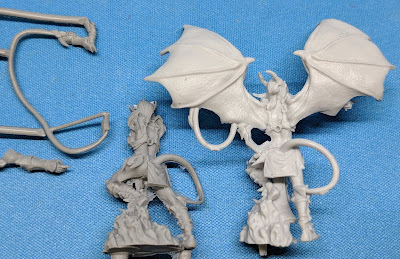 In the DS variant they are both open and spread out, while in the KoW version the left wing is actually folded around, almost shielding that side of her body (when assembled). This makes for a very interesting post, much different than (what appears to be) gargoyle wings added to the succubi. So, in summary, both versions of all the models are good, but the individual ones are superior casts. Which do I recommend? Well that really depends on what you want. 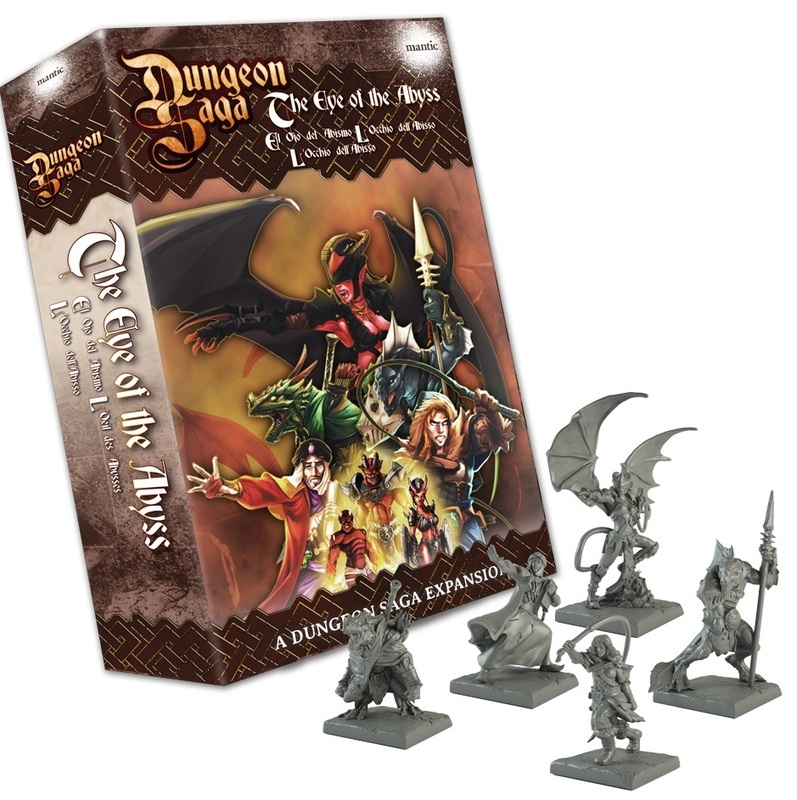 If you are a Dungeon Saga player, then of course you want this expansion, not just for the models but the character cards and adventures. 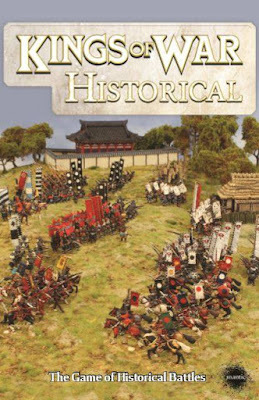 If you are a Kings of War player who doesn't play Dungeon Saga (and why not, it is a really fun game, even if the boss characters don't seem to hold up against the leveled up adventurers like they should) which should you buy? Well if you only want one character - then $17.99 MSRP for a single character is the way to go. 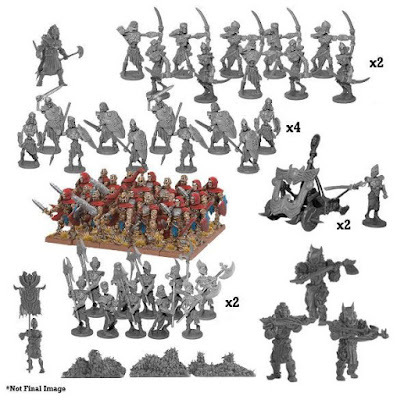 If you want ALL of them - the KoW variants would run $89.95 for the set, as opposed to $49.99 for this expansion. So if you want all AND cost is a factor, then the DS set is a better buy, and the figures are generally NOT bad enough to be unusable. 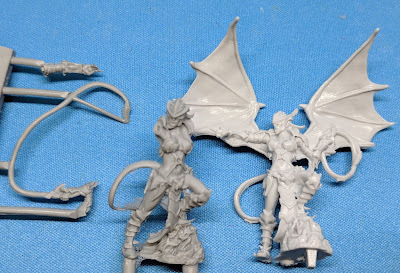 Finally, if you are pursuing painting perfection, you most likely will want the separate models for the crisper details (though I can't help but wonder if a top painter couldn't take advantage of the rougher texture on some of these (like Artakl). 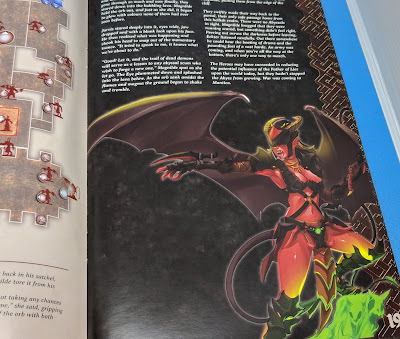 As for the gameplay - I look forward to getting back to playing some Dungeon Saga (we still have the Tyrant of Halpi expansion to go (though while I HAD two dragons, they both have now become wingless blue beasts of Nature in my son's attempt to win with a lightning bolt spam heavy nature list), as well as this one now). 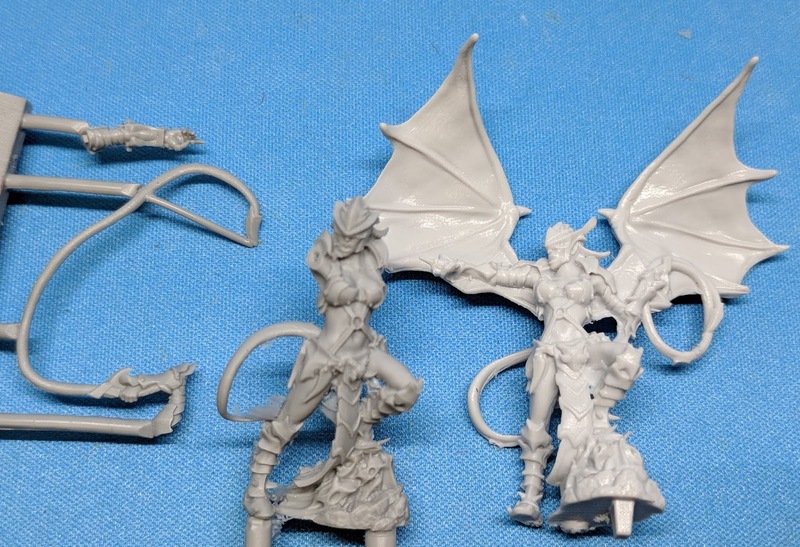 Do you have any preference for any of these sculpts for your future projects?